Enter George Oliphant and the NBC George to the Rescue team who arrive on the scene to create a play space for a dad the cutest baby you’ve ever seen. A home is not just a structure built out of wood and nails, it is the place where you build a life. Dennis and his wife Megan had made plans for their home to grow with their expanding family as they welcomed their son, Declan into the world. When Megan passed shortly after the birth of their son, Dennis knew he wanted to continue with the plans he and his late wife had made to give Declan a space to grow and play. Enter George Oliphant and the NBC George to the Rescue team who arrive on the scene to create a play space for a dad and the cutest baby you’ve ever seen. “A rescue will change the meaning of home for Declan. It will give me the chance to make more memories with my son,” Dennis says. And that is what home is all about. 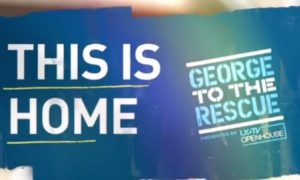 Be sure to watch the “This is Home” segment below and catch the complete episode on NBC. On this episode of George to the Rescue, the team creates a space that this growing family call their own. George Oliphant and his team of contractors and designers on NBC George to the Rescue design a safe, multi-functional basement space for two loving parents and their children.